Is this the best football game ever? Well, maybe not, but this was a game that you found yourself playing into the early hours, propping up your eyelids with matchsticks. Okay, so it didn't feature the best graphics around, but playability is far more important for me, and this game had bucket loads of it! 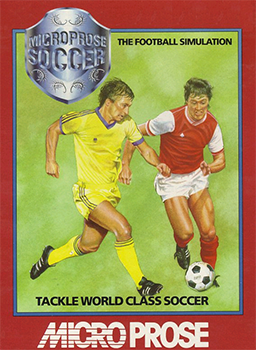 Created by Sensible Software, many would argue that this was the prequel to Sensible Soccer. In the game you had the choice of playing a full World Cup tournament with 11 players, or an indoor league 6-a-side tournament. If you weren't ready for either, you could opt to play a non-tournament game. The game was originally made available for the Commodore 64, but was later ported to the other 8-bit and 16-bit computers including the Amstrad CPC, ZX Spectrum, Atari ST, Amiga and DOS for the PC. However, the 16-bit version wasn't as well-received. The 8-bit version is definitely the one regarded as a classic, and what really made the game shine was the simple control system. Using a joystick, this allowed the player to simply enjoy a fast-flowing game of footie, without being bogged down with complex controls. The action replay sequence was also a joy to watch, and pretty novel back in the 80s. On the C64 version it looked like you were rewinding a video tape. We have to remember that the game was never designed to be a simulation, it was designed to be fun and easy to play, and that aspect makes Microprose Soccer the best computer football game of the 80s, and the control system inspired many of the footie games that followed it in the 90s.